SUZUKI SHOWS WHO’S B.O.S.S. | Throttle Life! Every family needs a boss, but just one is not enough for the Suzuki Boulevard cruiser family. 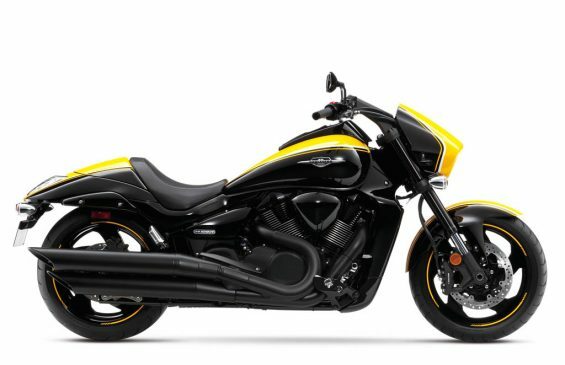 Building on the success of its 2013 Suzuki Boulevard B.O.S.S. C90T, Suzuki now turns the spotlight on three additional blacked-out Suzuki Boulevard cruisers. Suzuki introduces the Boulevard C90 B.O.S.S., the Boulevard M109R B.O.S.S., and Boulevard C50 B.O.S.S. The 2013 Suzuki Boulevard C90 B.O.S.S. extends Suzuki’s classic cruiser lineup. Much of the look and performance is already proven by the 2013 C90T B.O.S.S., but Suzuki decided to strip away the touring bike’s windshield and factory-issued hard bags to deliver a new Blacked Out Special Suzuki (B.O.S.S.) in classic fashion. The new C90 B.O.S.S. features black treatments on wheels, forks, exhaust, engine covers and more. Owners can still trust the power of its 90-cubic-inch (1462cc) powerplant, the comfort of its long-and-low steel chassis and the dependability of shaft drive. The 2014 Suzuki Boulevard M109R B.O.S.S. uses its muscular engine and singular styling to lead this pack. With the new styling, this M109R B.O.S.S. is designed with a look that owners usually pay thousands extra to get. Black wheels, handlebars, mufflers, fork tubes, engine covers, brake calipers and more. The aggressive styling is awoken by Marble Daytona Yellow complement coloring atop the gas tank, fenders and headlight, and in racy detail wheel striping. The continued strong performance is due to its 109-cubic-inch (1783cc) liquid-cooled engine with Suzuki Dual Throttle Valve fuel injection. Running on a massive 240mm rear tire and inverted front forks with race-proven cartridge internal components, the M109R’s ride characteristic is unmistakably Suzuki Boulevard. Based on one of Suzuki’s best-selling cruisers, the 2014 Suzuki Boulevard C50 B.O.S.S. brings the same sleek appeal to the middleweight cruiser class. From its cast wheels to the handlebars and all along the slash-cut mufflers, what was chrome is now abundantly black. This cruiser’s performance remains recognizably strong; its 50-cubic-inch (805cc) fuel-injected and liquid-cooled powerplant helps boost the hallmark V-Twin’s low-down torque, while producing the sharp V-Twin rumble. The expanded family of Suzuki Boulevard B.O.S.S. cruisers will begin arriving in Suzuki dealerships across the United States beginning in late July. Coinciding with the new Suzuki Boulevard B.O.S.S. launch, Suzuki will provide a special blacked-out experience on its website over the Memorial Day Weekend. Visit www.suzukicycles.com. Follow us on Twitter and Facebook for more updates.